Pictured, from left to right: Joshua Cocker, Conor Casey, Alex Tran and Brooke Nesselt. Three engineering students in a four-person University of Maryland team won first place and a $4,000 prize in the national Deloitte Consulting Undergraduate Case Study Competition, held in Westlake, Texas, from March 9-11, 2017. Among 17 universities represented in the competition, the UMD team was challenged to develop a practical solution for an online clothing retailer to establish brick-and-mortar operations. Team solutions had to adhere to Deloitte’s three-segment consulting method, which includes human capital, technology, and strategy and operations. 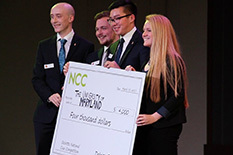 The event culminated with four finalist teams presenting onstage to an audience of more than 100 Deloitte employees and participating universities. The UMD team included sophomores Conor Casey (aerospace engineering, EIP, QUEST), Joshua Cocker (mechanical engineering, EIP, QUEST), Brooke Nesselt (mechanical engineering, EIP, QUEST, Flexus), and Alexander Tran (finance & information systems, QUEST, College Park Scholars, Environment, Technology & Economy). Clark School alumna Kimberly Berlic (2012, mechanical engineering), now a consultant with Deloitte, mentored the UMD team at the national competition. The team also drew from lessons learned through the Entrepreneurship and Innovation Program (EIP) and QUEST honors initiatives. The event was the team’s second trip to the national competition after winning the campus competition two years straight.